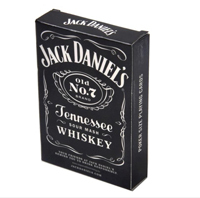 Authentic Jack Daniel's playing cards from Hoyle Products. 2 styles sold assorted. Official Licensed Product. Dimensions: 2-1/4 in. x 3/4 in. x 3-1/2 in.